Biofuel production from waste biomass is increasingly being focused on due to due to several advantages of lignocellulosic biomass, such as availability in abundance from several sources, cost-effectiveness, little competition with food sources, etc. This new volume, Sustainable Biofuel and Biomass: Advances and Impacts, provides an abundance of in-depth information on many types of biofuels from lignocellulosic biomass and also describes biomass sources and their availability for biofuel production. 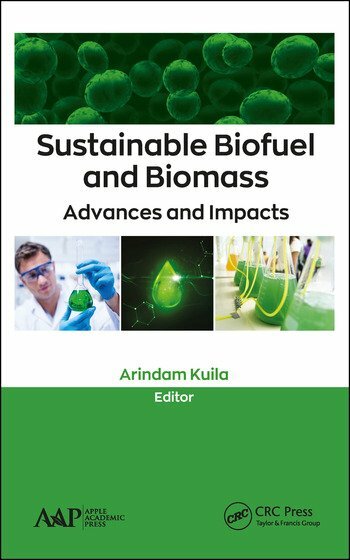 This compiled book features 17 chapters that discuss the different aspects of biofuel production from lignocellulosic biomass. Chapters deal with different types lipase-mediated biofuel production, biohydrogen production from lignocellulosic biomass, triacylglycrol biosynthetic pathways in plants for biofuel applications, the industrial prospects of lignocellulosic bioethanol production, biofuel cell production, potential feedstocks availability for bioethanol production, biofuel production from algal biomass, and many other important topics. Luiza Helena Da Silva Martins et al. João Moreira Neto et al. Arindam Kuila, PhD, is currently working as Assistant Professor in the Department of Bioscience and Biotechnology at the university Banasthali Vidyapith in Rajasthan, India.